Answers.com defines a good beach book as “engaging and a quick enough read that you can finish most of it on the beach before your sunscreen wears off. A beach book isn’t necessarily literature, but a beach book will entertain.”So, what book could be assigned for summer reading that engages students but isn’t necessarily great literature? 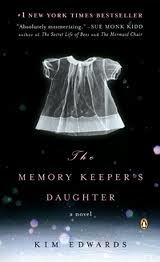 The Memory Keeper’s Daughter by Kim Edwards is a good choice. The story opens with a snowstorm on the night Norah Henry goes into labor. On the way to the hospital, she anticipates that, “when we come back, we’ll have our baby with us…our world will never be the same,” not knowing how dramatically accurate that statement will be in the novel. Because of a staff shortage that wintry night, her husband, Dr. David Henry, delivers his twin children, Paul and Phoebe. However, while Norah is unconscious, David recognizes that Phoebe is a Down Syndrome baby, and decides to tell Norah that the little girl dies in childbirth. David instructs Caroline Gill, a nurse, to place the child for adoption. Caroline, however, keeps Phoebe as her own. The novel centers on David’s decision and its consequences for Norah and Caroline. “There was an unnatural welling quite in the nearly empty lot, a silence that seemed to emanate from the cold itself, to expand in the air and flow outwards like ripples from a stone thrown in water. Snow billowed, stinging her face, when she opened the car door. Instinctively, protectively she curved herself around the box and wedged into the backseat where the pink blankets fell softly on the white vinyl upholstery. The baby slept, a fierce, intent newborn sleep, its face clenched, its eyes slits, its nose and chin mere bumps. You wouldn’t know, Caroline thought, if you didn’t know, you wouldn’t know” (21). Edwards had published short fiction prior to her debut novel. The Memory Keeper’s Daughter was published in June 2005 and gained great interest via word of mouth in the summer of 2006. Apparently, the book was very popular as a beach read with book groups as well! There was also a made-for-television movie on Lifetime Television in 2008 with Dermot Mulroney as David, Gretchen Mol as Norah, and Emily Watson as Caroline. This was the most watched movie of the week that April, and the film was released as a DVD. There are always multiple copies of this title at used book sales. In one year, I have collected enough copies of the text so that Advanced Placement students each took home a copy to read this past June. In total, I have purchased over 40 copies of this text which retail for $9.20 at Amazon. I have spent $40-50 to have this text as summer reading; the same copies new would have cost $368.00. So what if the copies of The Memory Keeper’s Daughter happen to get a little sand or salt water on them? I have enough back up copies to replace any summer-damaged texts. In fact, I am counting on them being read on the beach!